I am blessed with a wealth of beautiful and specular birds in my backyard due to an abundance of trees, bushes, and flowers. Last week while I was practicing my tai chi early in the morning, I saw a beautiful parrot green bird about the size of a small Robin with a prominent tail, a blue feather, and a white/gray face and chest sitting on the patio fence post. Wow! The green color and prominent blue tail feather suggested that this bird was not a native. I quickly grabbed my IPhone and started to take pictures. I moved slowly towards the bird while it sat there making me realize that this bird was different. It appeared to be tame. 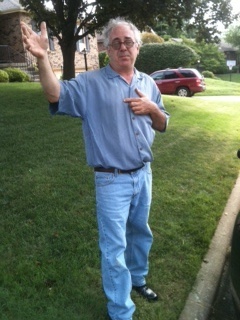 I ran into my house to wake up Pat, my wife, so she could see this once-in-a-lifetime scene. 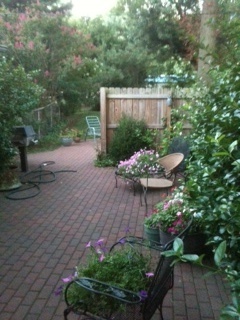 When Pat got to the patio she started to talk to the bird, like you talk to a baby. After a proper introduction of 5 minutes or so the comfort level grew and the bird flew 15 feet to perch on her shoulder. Another amazing event! Pat walked into the house with the bird perched on her shoulder, while we tried to figure this out. Of course, we had to lock up our cat. 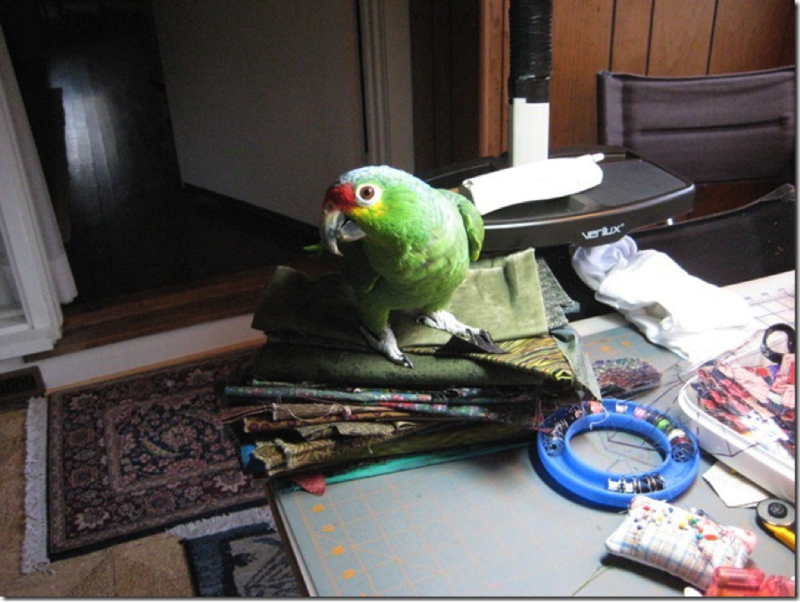 We called our family veterinarian and my dear sister Janet in Pennsylvania, who owns a Red Lored Amazon parrotnamed Kiwi that also escaped and lived outdoors for about a month. This was a traumatic experience for my sister that ended on a good note. An Amazon parrot can live over 100 years, so owing one is a lifetime commitment requiring some planning for its care after you are gone. In the meantime, we gave the bird water and fed it some corn and carrots as suggested by my sister, while it was perched on the hand of my daughter Elizabeth, who arrived to help. The bird responded to Elizabeth saying, “thank you, thank you.” When Elizabeth said “kissy, kissy” the bird pecked her on the cheek. Indeed, this was one smart bird. We finally decided that the best plan was to take the bird to our local veterinarian while we tried to figure this out. We loaded the bird into a carrier and were getting ready to take the bird to the veterinarian when the cage top got jostled and in the blink of an eye the bird escaped flying to a nearby tree. Now I was in big trouble, unless there was a happy ending to this saga. You know the feeling. My sister Janet called back a few minutes later telling me based on the picture I sent her from my IPhone that the bird was a Quaker parrot. They are called Quakers because of the prominent white/grey front running from their beak down their breast. Now I had something to go on. 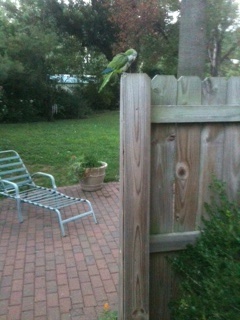 A quick check on the Internet for a lost Quaker parrot in Springfield, Missouri showed one hit. 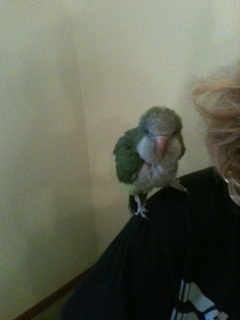 On May 8, 2011 – Lost Parrot with markings “quaker parrot green and gray with some blue” by the name of “gooneybird” who is very gregarious and who would land on someone “to take him.” Gooneybird was lost at Glenstone and Kearney in Springfield, Missouri, a distance of over 4 miles from my house generally due south. Figure the odds, surely a 99.9 % probability of a perfect match. After sending an e-mail and leaving a voice message for the owner he called and was elated to know that Goneybird had been found, even if he was not yet secure. Still we all wondered would Gooneybird fly off or could he even be coaxed from the tree? In a short time the owner arrived and Goooneybird flew to his arm and perched. Gooneybird was saved! The owner was elated while he securely placed Gooneybird in his car. The owner reports that Gooneybird had lost nearly one-third of his bodyweight and had only a few days to live but is now gaining strength and clucking more soundly. He is eating fettuccini, grapes and rice and his appetite is improving. When Gooneybird is asked by his owner, where are you? Gonneybird responds, “Thanks a lot.” Gooneybird’s companion, Bluebird, another parrot is being a nuisance and has gotten “very bitey.” My sister Janet, who also lost and recovered her parrot some 20 years ago, marveled at how communications have improved with the Internet. From start to finish the whole episode, from the time Gooneybird entered the life of my family to the time he was rescued, was about 3 hours. With the IPhone in hand I could instantly mail a picture to my sister who was able to identify the bird in a few minutes. Once the bird was identified as a Quaker parrot and I typed in a simple search on Goggle it was a fraction of a New York second to get a response and a short minute to scroll down to search for a missing Quaker parrot. This short episode shows the unique bond and love formed between an owner and a pet. 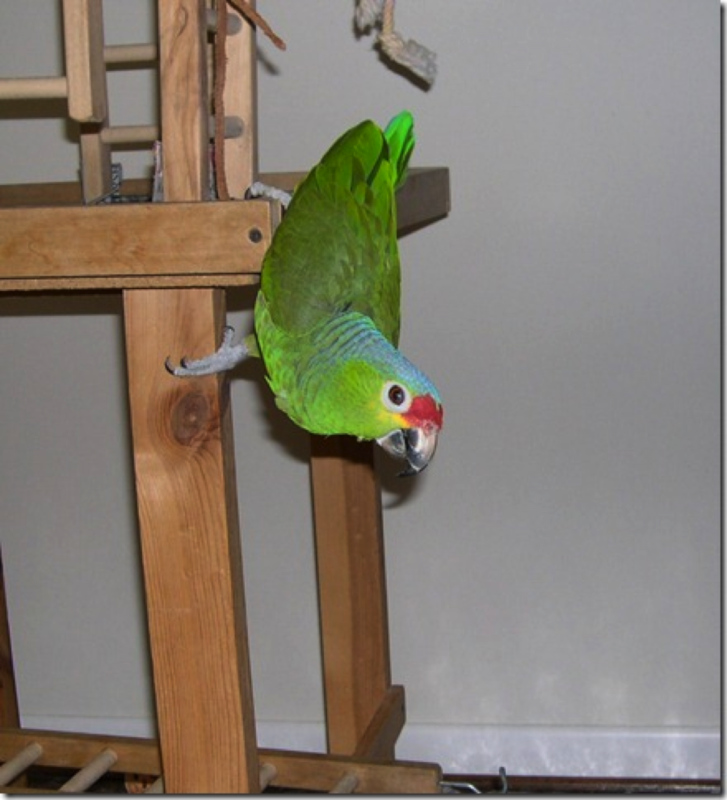 This entry was posted in Musings and tagged Finding Lost Pet Using the Internet, How the Internet Saved a Parrot, Lost Parrot, Quaker Parrot Lost, Red Lored Amazon Parrot. Bookmark the permalink. How wonderful is that! I’ve lost a bird before (my greatest friend as a child – my cockatiel) due to a fright when bringing him back into the house, apparently strong wings, and the fact I didn’t clip his wings because I thought it wasn’t my right to take that away from him. I’m so glad you guys found this Quaker and got him to his owner:) I own a Quaker now and they are hardy, comical little buggers. Thanks. I know how much owners love their birds based on my sisters experience. It was a thrill to have this wonderful bird come into my life.